The New Orleans arrives in Louisville (Oct. 28, 1811), painting by Gary R. Lucy. At the beginning of this period, Nicholas Roosevelt was supervising the completion of the New Orleans. After a successful test run, the New Orleans steamed out of Pittsburgh on Sunday, October 20. Although the Roosevelts' neighbors thought that Lydia should stay in Pittsburgh, rather than accompany her husband on what might be a dangerous journey, the Roosevelts insisted on making the trip as a team. 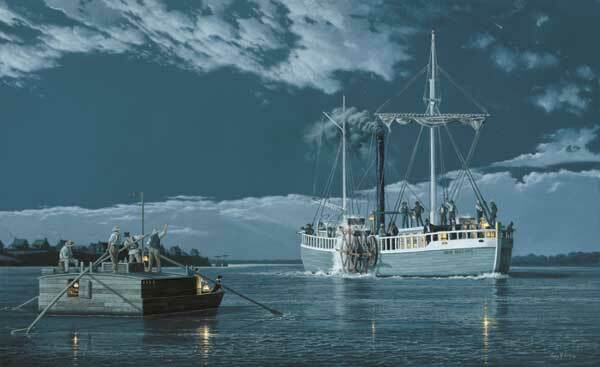 With the Great Comet of 1811 in the sky above them, the Roosevelts, their toddler daughter, and the crew steamed into Louisville late on October 28. There, on October 30, Lydia gave birth to their son, Henry Latrobe Roosevelt. They stayed in Louisville through November, waiting for the river to rise enough to allow them through the Falls of the Ohio. Meanwhile, long-tense relations between American settlers and Native Americans turned to open conflict in the Battle of Tippecanoe on November 7 (in what is now northwestern Indiana). Tensions throughout the area were such that many Native Americans along the Mississippi perceived the New Orleans' presence as a threat. Sept. 18, 1811, Liberty Hall - Gov. William Henry Harrison requests cavalry from Kentucky for his "proposed expedition against the Indians"
Oct. 18, 1811, Pittsburgh Gazette - the New Orleans makes a trial run and "fully answers the most sanguine expectations"
Oct. 23, 1811, Liberty Hall - "Mr. Roosevelt, it is stated, is building a Steam Boat, to run on the Ohio and Mississippi"
Oct. 25, 1811, Pittsburgh Gazette - "The Steam Boat sailed from this place on Sunday last."